Written by Ray Martin on November 1st, 2018 January 3rd, 2019 . 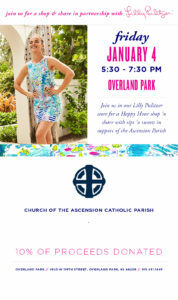 Friday evening Happy Hour while giving back a percentage of their sales that evening to ASCENSION! All you do is mention ASCENSION when entering either store! It is that easy! Make it a “Girls Night” and go shopping with your best friend! Mardi Gras Dinner & Auction! Visit these stores at the following locations!